Over the last 11 years, diversity on the California bench has slowly but steadily increased, according to a legislatively mandated annual report released today by the Judicial Council. 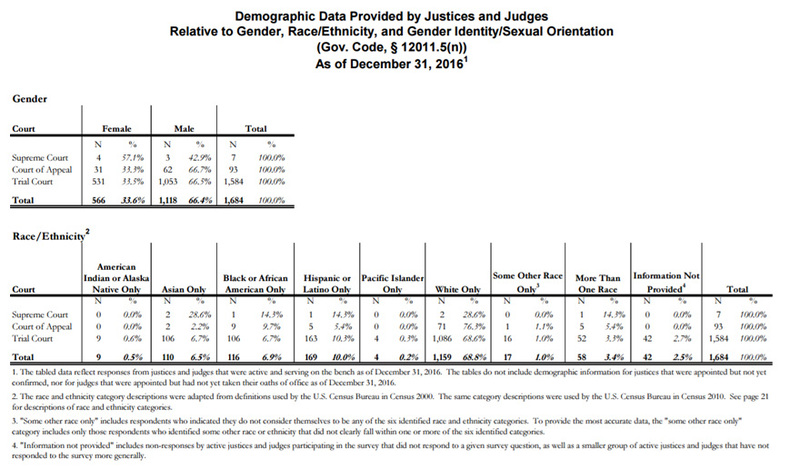 The report contains demographic data on the race/ethnicity, gender, gender identity, sexual orientation, and veteran and disability status of California state justices and judges on the bench as of December 31, 2016. Government Code section 12011.5(n) requires the Judicial Council to collect and release aggregate demographic data on California state justices and judges by March 1 every year. This is the eleventh year that the information has been collected and released. Responding to the questionnaire is entirely voluntary for judges. On that basis, the data reported reflects the responses of only those judicial officers that provided demographic data. The data show a trend toward an increasing percentage of female trial court judges in 2016. Women now represent 33.5 percent of superior court judges, compared to 26.8 percent in 2006, continuing a steady upward trend over the past 10 years. Information Not Provided (2.5 percent in 2016 compared to 9.9 percent in 2006). These changes reflect judicial retirements and other departures from the bench, new judicial appointments, and an increase in the number of trial court judges who voluntarily provided race/ethnicity information. Information not provided, 31.5 percent. In addition, this is the third year that the study includes data on veteran and disability status. These questions were first asked of justices and judges who were new to the bench during the 2014 calendar year, although judges appointed before this date are free to update this aspect of their demographic profile as well. Of the 360 trial court judges responding to the question about their status as a veteran, 31 respondents (9%) indicated they have served in the military. Of the 363 judges responding to the question concerning their disability status, 8 judges (2%) indicated they have a disability. Increasing the diversity of California’s judicial officers to reflect the rich diversity of California’s populace continues to be a key goal of the Judicial Council. Visit Governor Brown’s website for demographic information on judicial appointments.